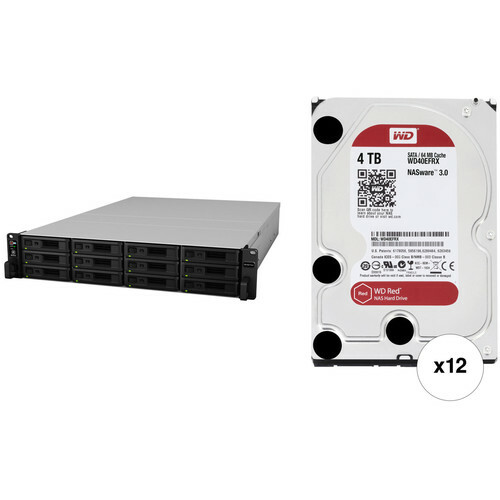 This B&H Kit combines the Synology RackStation RS18017xs+ 12-Bay NAS Enclosure with twelve WD 4TB Red 5400 rpm SATA III 3.5" Internal NAS HDDs for a total storage capacity of 48TB. The RS18017xs+ is built for flexible storage management with fast performance at over 568,000 sequential read IOPS and 4800 MB/s sequential read throughputs. DDR4 ECC RDIMM and 10GbE connectivity provide data accuracy and performance for a mission-critical environment. The Btrfs file system introduces advanced storage technologies to meet the management needs of modern large scale businesses: flexible shared folder/user quota system, snapshot replication, file or folder level data restoration, and automatic file self-healing detection and recovery. The RS18017xs+ comes with a high-availability feature that helps ensure seamless transition between clustered servers in the event of a server failure with minimal impact to applications. To maximize storage space, Hyper Backup is available for backing up data in multiple versions with block-level incremental backup and cross-version deduplication. Moreover, the RS18017xs+ includes Cloud Station suite, providing automatic cross-platform data synchronization with file version control. Designed with home and small office/business customers in mind, the 4TB Red 5400 rpm SATA III 3.5" Internal NAS HDD from WD is well-suited for NAS environments with up to eight 3.5" drive bays. Engineered to handle increased workloads, this 4TB drive operates using a SATA III 6 Gb/s interface, a 64MB cache, and a rotational speed of 5400 rpm, all of which help to ensure uninterrupted data transfers with a sustained rate of up to 150 MB/s. This drive also features high levels of reliability, with 600,000 load/unload cycles, <10 in 1014 non-recoverable read errors per bits read, error recovery controls, and 1,000,000 hours MTBF for 1-8 bay NAS systems. Also built into this drive are noise and vibration protection and WD's NASware 3.0 helps increase system compatibility, allowing WD Red drives to be more easily integrated with your existing network infrastructure. Number of Bays 12 x 2.5"/3.5"
Box Dimensions (LxWxH) 33.5 x 24.0 x 9.0"
Box Dimensions (LxWxH) 8.5 x 6.1 x 2.9"